Back in Ecuador, but with the impressions provoked by the magnificence of the Swiss Alps still fresh in my mind, I sit down at my desk and take this opportunity to share with the readers of Escoouth what has been done in Switzerland to keep forests alive, which is the same as to think about tomorrow. 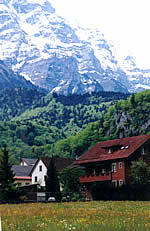 The Swiss Alps, compared to the Andes in Ecuador, are quite different: here in Glarus. The mountains are like walls with very irregular peaks, whereas the Andes are softer and high. But there are also similarities; we who live on or among the mountains, have many things in common, independent of geography. Mountains villagers, the ancestral inhabitants of these places had to value the meaning of highly optimizing resources in order to survive in the light of such a high level of poverty. In some way, this has led them to be “sustainable”, and to develop apparently simple systems and technologies to solve complex problems, by taking from the land and always giving back, which is the most rational way of taking advantage from it. Much of what I call life dreams has been achieved here not because of comfort and “facilities” provided by so much technology and by the arrangement of today’s society, but mainly thanks to the maturity of the population and its governors, who involve the people in setting the policies, and who are able to make the wisest decisions. In this respect, the concentration of people from the entire Canton of Glarus in the capital Glarus is amazing. The first Sunday of May every year they celebrate the “Landsgemeinde”, a political meeting where the people make their decisions after open and frank discussions among them and where “political debate” by common persons in the central squares has the greatest relevance. Here, politicians are at the service of the people, and they do not serve themselves from them. 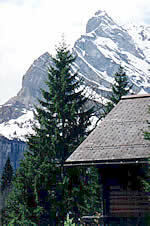 This is not a dream in the Canton of Glarus, this is a reality with a long history. Undoubtedly, such a way of making political decision is a very important part of its development. And, although it is quite clear that the Landsgemeinde is celebrated in very few other places apart from the Canton of Glarus, to a great extent it reflects its system of designing lasting policies due to continuity and popular participation. The The efficient decentralization of Switzerland has contributed to using resources where necessary and they have become “actors of their own development”. There is no theory here, there is daily practice. One of the greatest experiences was meeting with a mountain farmer, to feel his world and the inter-relation with his work in the countryside, the area’s nature as well as the meaning of living under the changes generated by the four seasons of the year. They certainly prepare themselves with anticipation and planning and they have come to follow the rhythm of each season. This responds culturally to important aspects such as: order, balance and respect for the land and the water provided by the mountains. Development may be advanced here, but different from other places. They still use some very simple technology, and details that might be considered insignificant become very valuable, and all this has contributed to improve comfort and living conditions. For example, an efficient firewood cooker that we are going to produce in an project in Ecuador and a wooden bench very appropriate for milking cows, of which I brought one in my suitcase, which is already in the hands of local artisans for reproduction. I also had the opportunity to make two presentations about what is being done in the mountains of Ecuador. The first before a group of men and women from the church of town of Ennenda, that contributed to the Ecuador project with their collections, and this allowed me to explain to them work in the housing projects. 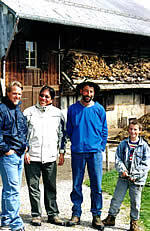 The second presentation in Schwanden, organized by a group dedicated to environmentally and cultural themes, showed the people’s interest in getting to know more about the problems of Latin Amercian countries, even people from South America who, for one reason or another, study or live here. It is also worth mentioning that a leading member of the elected executive of the canton of Glarus was present and that the canton also contributed to the housing project in Ecuador. This visit occurred within the activities of the United Nations Year of the Mountains. Interchanges like these among people from different latitudes but with equal interests and worries concerning the surrounding environment and its preservation turn out to be vital, especially when we are engaged in developing sustainable practices and technologies for a higher life quality without damaging the environment.